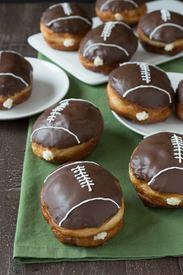 Cream filled chocolate football donuts! Today is National Coffee Day. Now, what goes better with coffee than donuts? Huh? Nothing, right! Making fried donuts is not difficult at all! Use refrigerated biscuits to make cream filled donuts! Decorate them to look like footballs for game day! Or eat them now!